Sharai is Managing Partner of Onyx Associates, LLC, a legal and strategic advisory group whose clients include Sustainable South Bronx, The Brooklyn Children’s Museum, the NYC District Council of Carpenters, The NYS Sickle Cell Advisory Consortium and the NYC Department of Health and Mental Hygiene. He possesses ten years of legal experience in community economic development, advising numerous community-based organizations in New York City and parts of Africa. 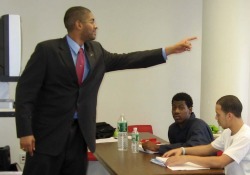 He also has over twenty years of community organizing experience in NYC at the executive level and seven years of experience as a curriculum developer and instructor to students generally between the ages of 18-25 years. Sharai is also the author of Passing Solidarity: One Man’s Search for Identity in a Global Context, a non-fiction travelogue, which has been featured at the Brooklyn Public Library Central Branch. He is a graduate of Cornell University and earned his law and MBA degrees from Northeastern University. Residing in Brooklyn with his family, Sharai is a supportive husband and the very involved father of two boys.